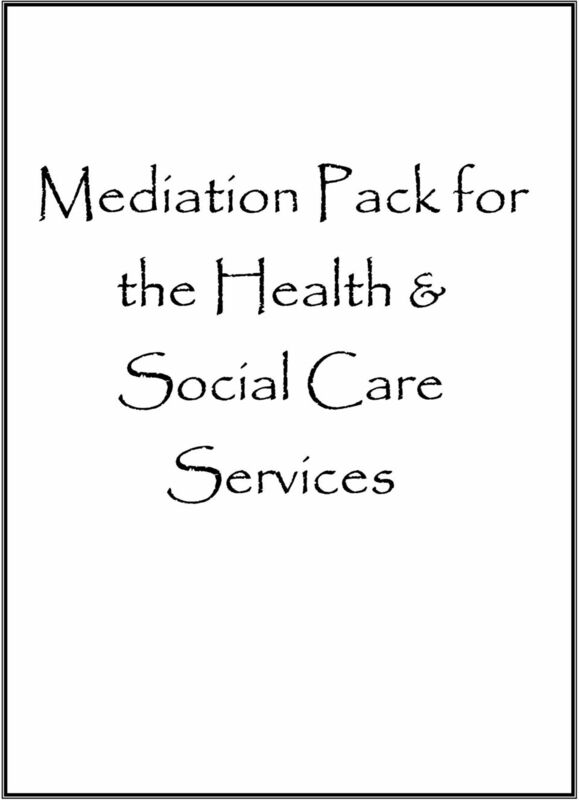 Download "Mediation Pack for the Health & Social Care Services"
3 Delivering a Mediation Service in the Health & Social Care Services in Ireland. 1. Introduction 1.1 The Health and Social Care Services (H&SCS) recognise the right of all employees to be treated with dignity and respect and is committed to ensuring that all employees are provided with a safe working environment which is free from all forms of bullying, sexual harassment and harassment. The H&SCS also sets out a complaints procedure which ensures that complaints are dealt with promptly and with sensitivity. 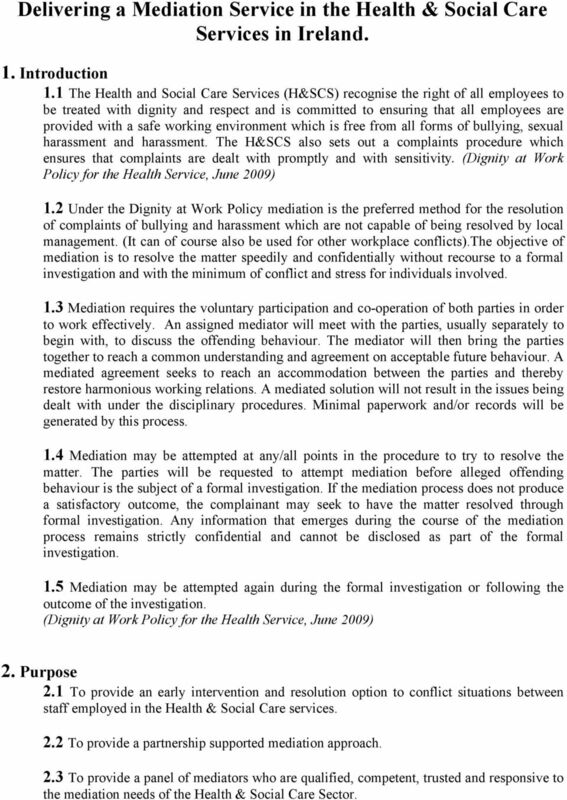 (Dignity at Work Policy for the Health Service, June 2009) 1.2 Under the Dignity at Work Policy mediation is the preferred method for the resolution of complaints of bullying and harassment which are not capable of being resolved by local management. (It can of course also be used for other workplace conflicts).the objective of mediation is to resolve the matter speedily and confidentially without recourse to a formal investigation and with the minimum of conflict and stress for individuals involved. 1.3 Mediation requires the voluntary participation and co-operation of both parties in order to work effectively. An assigned mediator will meet with the parties, usually separately to begin with, to discuss the offending behaviour. The mediator will then bring the parties together to reach a common understanding and agreement on acceptable future behaviour. A mediated agreement seeks to reach an accommodation between the parties and thereby restore harmonious working relations. A mediated solution will not result in the issues being dealt with under the disciplinary procedures. Minimal paperwork and/or records will be generated by this process. 1.4 Mediation may be attempted at any/all points in the procedure to try to resolve the matter. The parties will be requested to attempt mediation before alleged offending behaviour is the subject of a formal investigation. If the mediation process does not produce a satisfactory outcome, the complainant may seek to have the matter resolved through formal investigation. Any information that emerges during the course of the mediation process remains strictly confidential and cannot be disclosed as part of the formal investigation. 1.5 Mediation may be attempted again during the formal investigation or following the outcome of the investigation. (Dignity at Work Policy for the Health Service, June 2009) 2. Purpose 2.1 To provide an early intervention and resolution option to conflict situations between staff employed in the Health & Social Care services. 2.2 To provide a partnership supported mediation approach. 2.3 To provide a panel of mediators who are qualified, competent, trusted and responsive to the mediation needs of the Health & Social Care Sector. 4 2.4 To provide a mediation panel which will provide both a consistent standard and ethical approach. 2.5 To provide a value for money mediation service for the Health & Social Care Sector. 3. 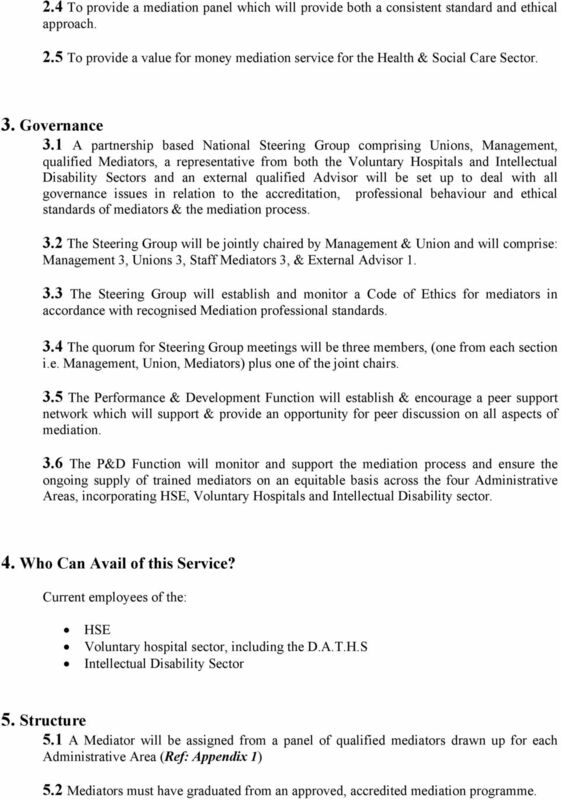 Governance 3.1 A partnership based National Steering Group comprising Unions, Management, qualified Mediators, a representative from both the Voluntary Hospitals and Intellectual Disability Sectors and an external qualified Advisor will be set up to deal with all governance issues in relation to the accreditation, professional behaviour and ethical standards of mediators & the mediation process. 3.2 The Steering Group will be jointly chaired by Management & Union and will comprise: Management 3, Unions 3, Staff Mediators 3, & External Advisor The Steering Group will establish and monitor a Code of Ethics for mediators in accordance with recognised Mediation professional standards. 3.4 The quorum for Steering Group meetings will be three members, (one from each section i.e. Management, Union, Mediators) plus one of the joint chairs. 3.5 The Performance & Development Function will establish & encourage a peer support network which will support & provide an opportunity for peer discussion on all aspects of mediation. 3.6 The P&D Function will monitor and support the mediation process and ensure the ongoing supply of trained mediators on an equitable basis across the four Administrative Areas, incorporating HSE, Voluntary Hospitals and Intellectual Disability sector. 4. Who Can Avail of this Service? Current employees of the: HSE Voluntary hospital sector, including the D.A.T.H.S Intellectual Disability Sector 5. 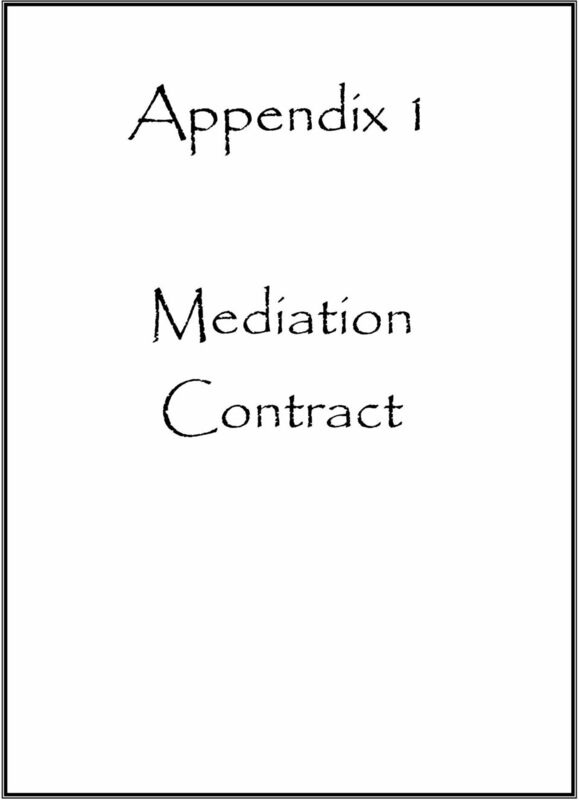 Structure 5.1 A Mediator will be assigned from a panel of qualified mediators drawn up for each Administrative Area (Ref: Appendix 1) 5.2 Mediators must have graduated from an approved, accredited mediation programme. 5 5.3 The HSE/HR functions in each HSE Administrative Area, in collaboration with the Performance & Development function and the local Voluntary Hospitals and Intellectual Disability. sector, will endeavour to ensure self sufficiency in the availability of mediators. 5.4 The local HR function will circulate the annual mediation list to managers and local trade union officials for approval. The list will then be signed off by the National Steering Group. 6. 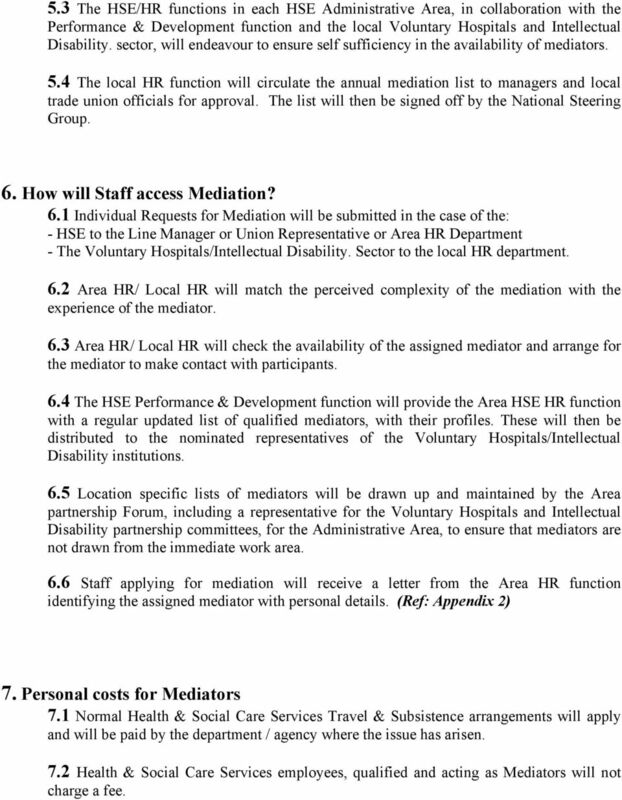 How will Staff access Mediation? 6.1 Individual Requests for Mediation will be submitted in the case of the: - HSE to the Line Manager or Union Representative or Area HR Department - The Voluntary Hospitals/Intellectual Disability. Sector to the local HR department. 6.2 Area HR/ Local HR will match the perceived complexity of the mediation with the experience of the mediator. 6.3 Area HR/ Local HR will check the availability of the assigned mediator and arrange for the mediator to make contact with participants. 6.4 The HSE Performance & Development function will provide the Area HSE HR function with a regular updated list of qualified mediators, with their profiles. These will then be distributed to the nominated representatives of the Voluntary Hospitals/Intellectual Disability institutions. 6.5 Location specific lists of mediators will be drawn up and maintained by the Area partnership Forum, including a representative for the Voluntary Hospitals and Intellectual Disability partnership committees, for the Administrative Area, to ensure that mediators are not drawn from the immediate work area. 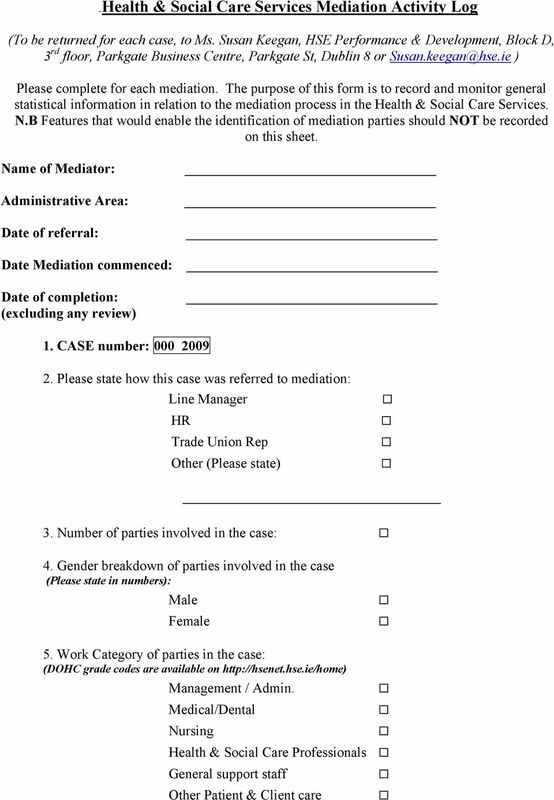 6.6 Staff applying for mediation will receive a letter from the Area HR function identifying the assigned mediator with personal details. (Ref: Appendix 2) 7. Personal costs for Mediators 7.1 Normal Health & Social Care Services Travel & Subsistence arrangements will apply and will be paid by the department / agency where the issue has arisen. 7.2 Health & Social Care Services employees, qualified and acting as Mediators will not charge a fee. 8 Dear Re: Mediation Assignment Thank you for agreeing to provide a mediation service for the Service. Your contact person to make appropriate meeting arrangements is: NAME TITLE TELEPHONE PARTIES TO MEDIATION You can contact the parties to explain the process and make appropriate arrangements as follows: NAME NAME TEL. 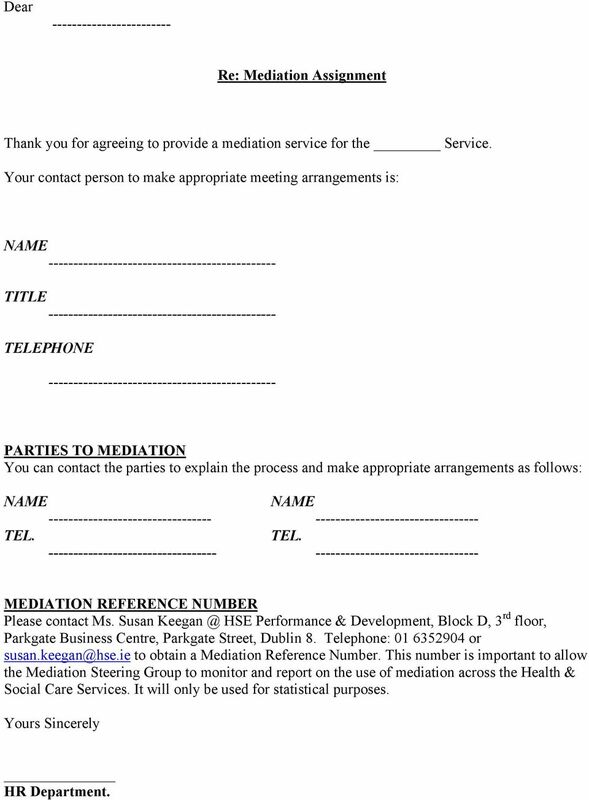 TEL MEDIATION REFERENCE NUMBER Please contact Ms. Susan HSE Performance & Development, Block D, 3 rd floor, Parkgate Business Centre, Parkgate Street, Dublin 8. Telephone: or to obtain a Mediation Reference Number. This number is important to allow the Mediation Steering Group to monitor and report on the use of mediation across the Health & Social Care Services. It will only be used for statistical purposes. Yours Sincerely HR Department. 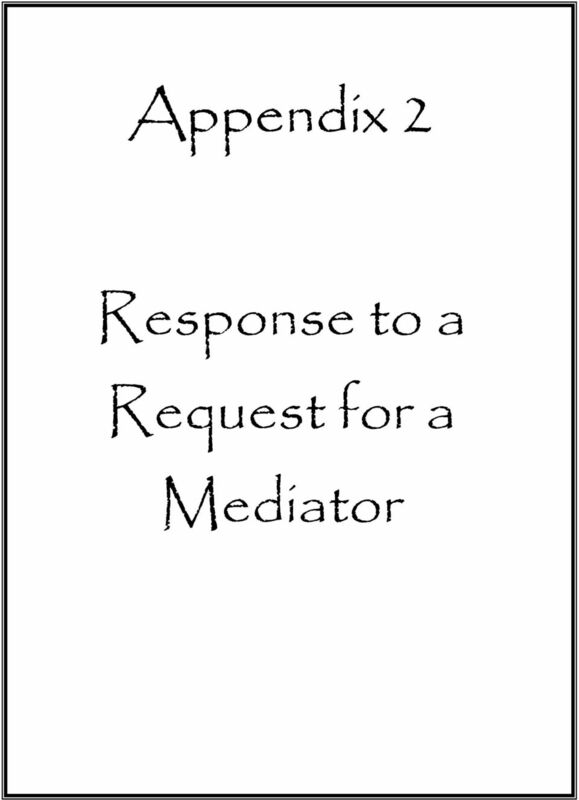 10 / /20 Dear Re: Response to a request for a Mediator. Further to your agreement to participate in a mediation process, I wish to advise you that you have been assigned: Mr / Mrs / Miss Job Title: Service / Function: Work location: will contact you shortly to make arrangements for mediation. Yours Sincerely HR Department. 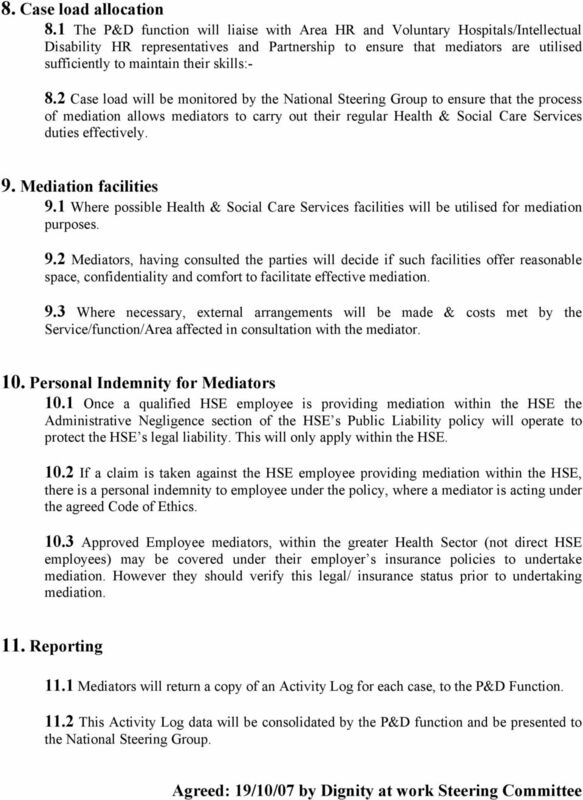 11 Code of Ethics for Mediators, (Employees of the Health & Social Care Services) who will be involved in the provision of an internal mediation service under the HSE Dignity at Work Policy. Mediation is the preferred method under the Dignity at Work Policy for the resolution of complaints of bullying and harassment which are not capable of being resolved by local management. It can of course be used for other workplace conflicts. 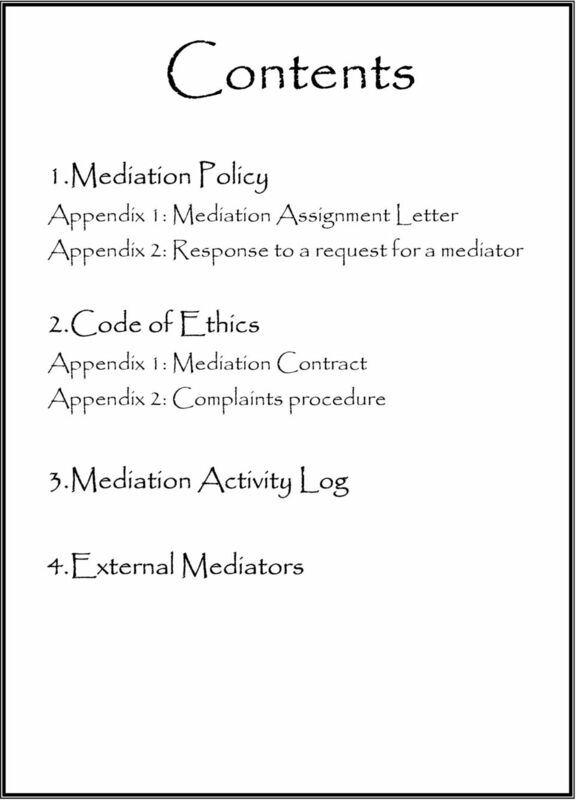 All those involved in providing this mediation service will be bound by the following Code of Ethics. 1. DEFINITIONS Mediation is a process in which an impartial and independent third party facilitates communication and negotiation and promotes voluntary decision making by the parties. It promotes voluntary decision making by the parties to assist them to reach a mutually acceptable solution. It can be accessed before any formal investigation, during the formal investigation or following the outcome of an investigation. Mediator a trained person who facilitates the process of mediation whilst acting at all times in accordance with the principles of impartiality, integrity, fairness and confidentiality with respect for all parties to the dispute and in accordance with the Code of Ethics. 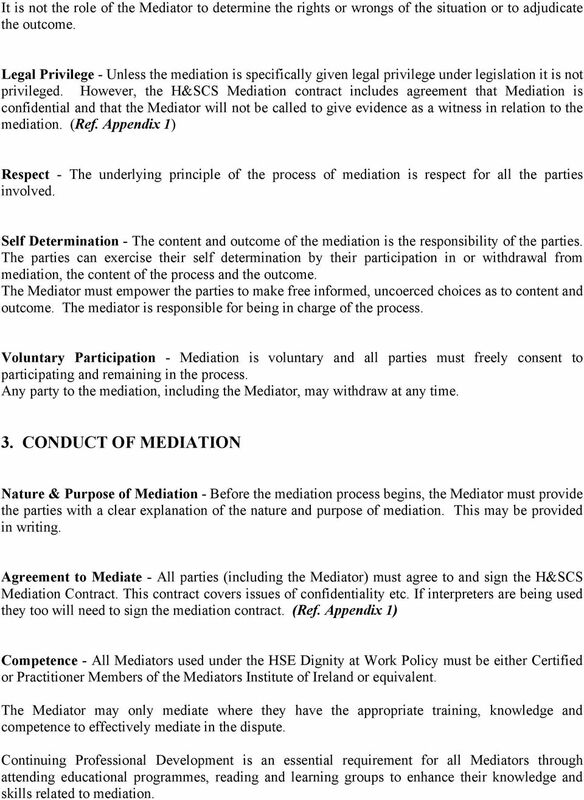 All internal & external mediators working under the HSE Dignity at Work Policy shall be either a Certified or Practitioner Member of the Mediators Institute of Ireland (or an equivalent qualification, as determined by the MII). 2. 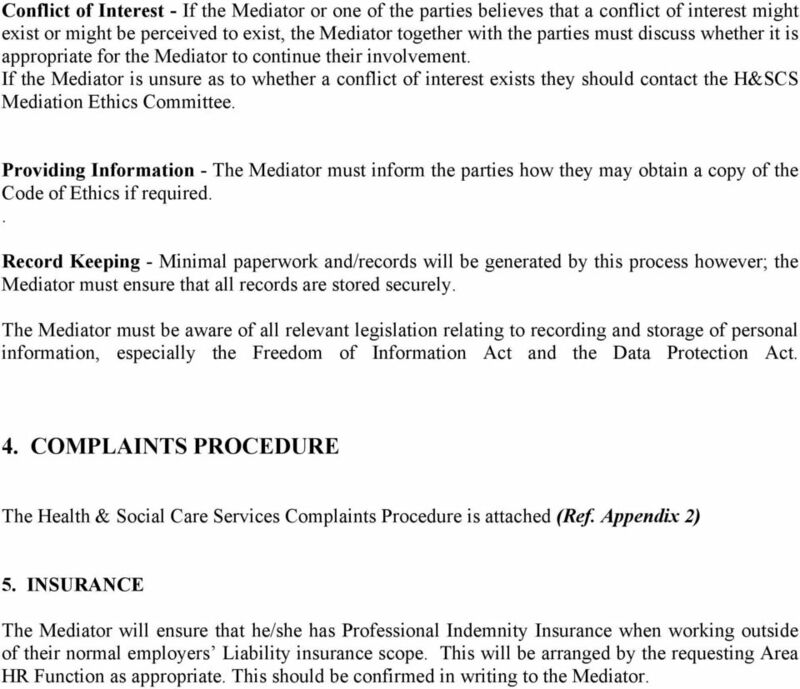 GENERAL PRINCIPLES OF MEDIATION Confidentiality - Mediation is confidential. 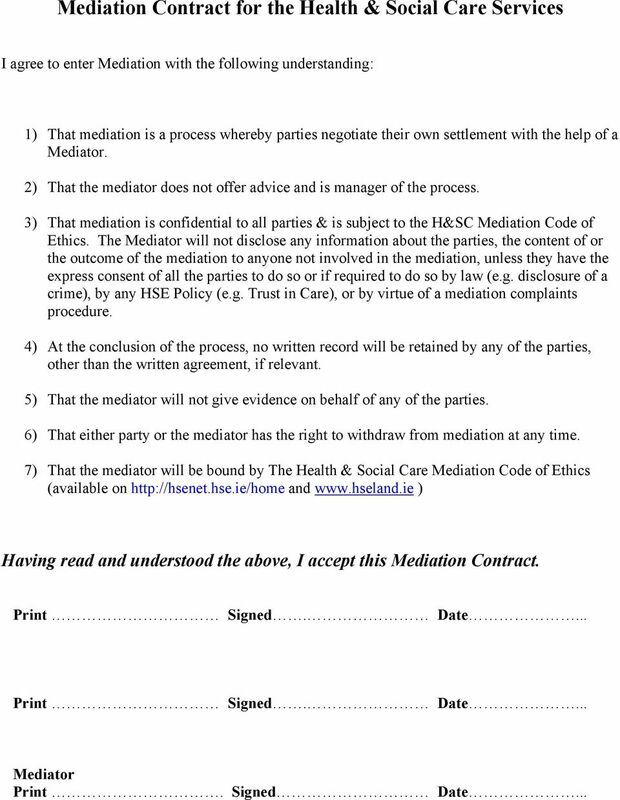 The Mediator will not disclose any information about the parties, the content of or the outcome of the mediation to anyone not involved in the mediation, unless they have the express consent of all the parties to do so or if required to do so by law, by any HSE Policy e.g. Trust in Care or by virtue of a mediation complaints procedure. When the Mediator is to meet with the parties individually, the parties and the Mediator will discuss and agree the confidentiality in advance of the meeting or series of meetings. Impartiality - The Mediator must act and be seen to act in an impartial manner throughout the process of mediation. Impartiality means freedom from favouritism, bias or prejudice. The Mediator must not take sides. Neutrality - The Mediator must remain neutral as to the content and outcome of the mediation. 12 It is not the role of the Mediator to determine the rights or wrongs of the situation or to adjudicate the outcome. Legal Privilege - Unless the mediation is specifically given legal privilege under legislation it is not privileged. However, the H&SCS Mediation contract includes agreement that Mediation is confidential and that the Mediator will not be called to give evidence as a witness in relation to the mediation. (Ref. Appendix 1) Respect - The underlying principle of the process of mediation is respect for all the parties involved. Self Determination - The content and outcome of the mediation is the responsibility of the parties. The parties can exercise their self determination by their participation in or withdrawal from mediation, the content of the process and the outcome. The Mediator must empower the parties to make free informed, uncoerced choices as to content and outcome. The mediator is responsible for being in charge of the process. Voluntary Participation - Mediation is voluntary and all parties must freely consent to participating and remaining in the process. Any party to the mediation, including the Mediator, may withdraw at any time. 3. 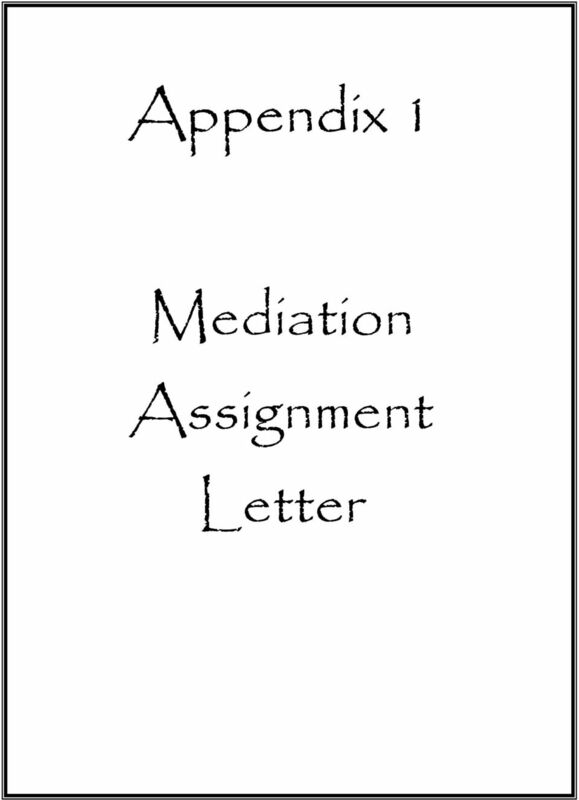 CONDUCT OF MEDIATION Nature & Purpose of Mediation - Before the mediation process begins, the Mediator must provide the parties with a clear explanation of the nature and purpose of mediation. This may be provided in writing. Agreement to Mediate - All parties (including the Mediator) must agree to and sign the H&SCS Mediation Contract. This contract covers issues of confidentiality etc. If interpreters are being used they too will need to sign the mediation contract. (Ref. 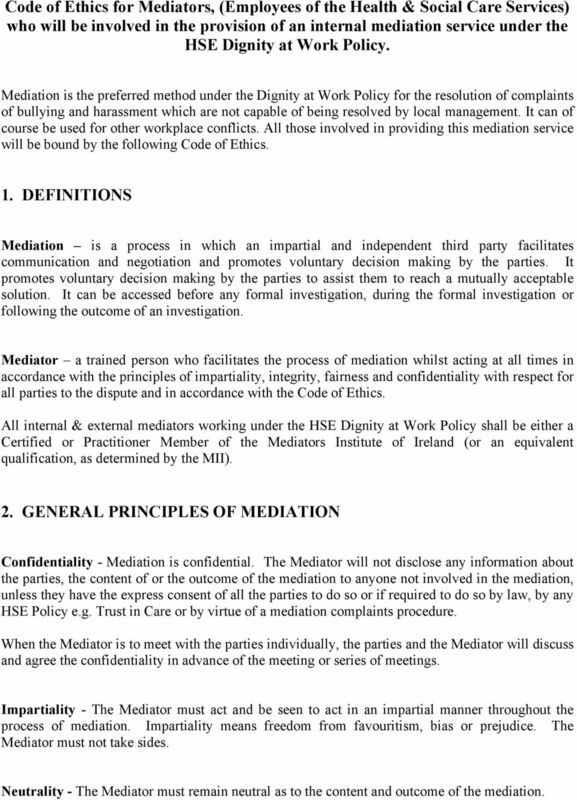 Appendix 1) Competence - All Mediators used under the HSE Dignity at Work Policy must be either Certified or Practitioner Members of the Mediators Institute of Ireland or equivalent. The Mediator may only mediate where they have the appropriate training, knowledge and competence to effectively mediate in the dispute. Continuing Professional Development is an essential requirement for all Mediators through attending educational programmes, reading and learning groups to enhance their knowledge and skills related to mediation. 13 Conflict of Interest - If the Mediator or one of the parties believes that a conflict of interest might exist or might be perceived to exist, the Mediator together with the parties must discuss whether it is appropriate for the Mediator to continue their involvement. If the Mediator is unsure as to whether a conflict of interest exists they should contact the H&SCS Mediation Ethics Committee. Providing Information - The Mediator must inform the parties how they may obtain a copy of the Code of Ethics if required.. Record Keeping - Minimal paperwork and/records will be generated by this process however; the Mediator must ensure that all records are stored securely. The Mediator must be aware of all relevant legislation relating to recording and storage of personal information, especially the Freedom of Information Act and the Data Protection Act. 4. 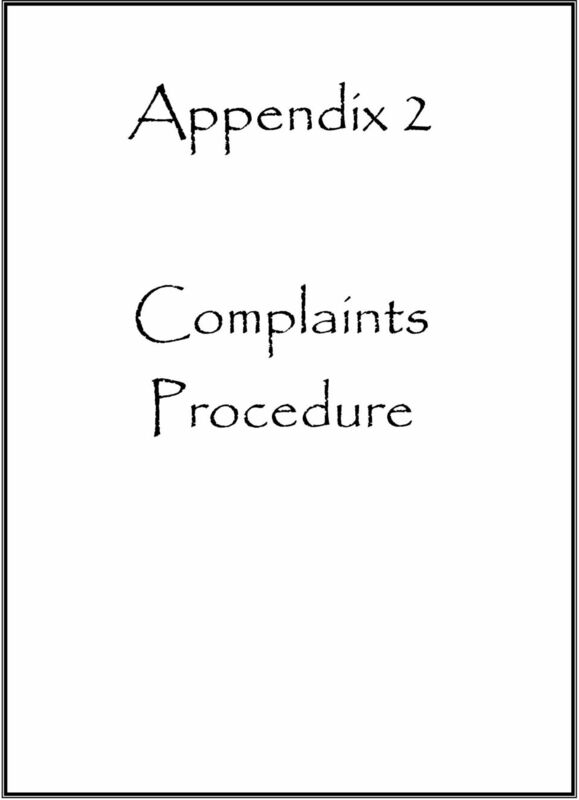 COMPLAINTS PROCEDURE The Health & Social Care Services Complaints Procedure is attached (Ref. Appendix 2) 5. INSURANCE The Mediator will ensure that he/she has Professional Indemnity Insurance when working outside of their normal employers Liability insurance scope. This will be arranged by the requesting Area HR Function as appropriate. This should be confirmed in writing to the Mediator. 18 2.3 Health & Social Care Staff Mediation Service Complaints Panel - A panel appointed by the Staff Mediation Steering group to deal with a complaint. 2.4 Complainant: Any of the parties to mediation. 3. Making a Complaint 3.1 A complaint may be made about a Mediator if it is believed that they have acted in breach of the Health & Social Care Mediator Code of Ethics. 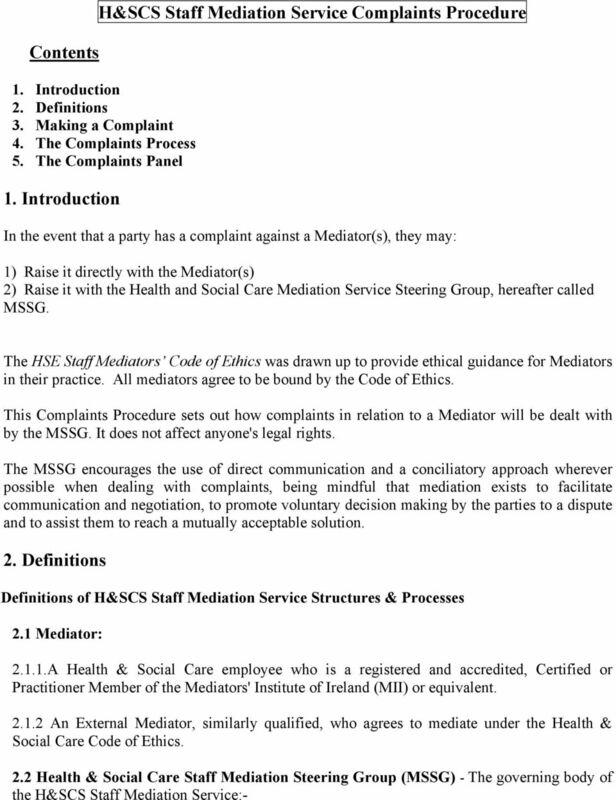 3.2 All complaints should be first raised with the Mediator directly. The HSE Mediation Service encourages all its Mediators to be open to hearing complaints and to respond promptly and appropriately. By raising the complaint directly with the Mediator, the complaint may then be resolved without the need to use a formal complaints process. 3.3 If these attempts to resolve the issue have not been successful, the complaint may then be brought to the attention of the MSSG. 3.4 A complaint being raised with the MSSG must be made within six months of the mediation process from which the complaint arises. If a complaint is made after six months, an explanation for the delay must be given and the MSSG in exceptional circumstances will have discretion in deciding whether to consider the complaint. 3.5 All complaints should be addressed to the MSSG Secretary. The Secretary will call the Complainant to discuss the possibility of them raising the issue directly with the Mediator, if they haven't done so already. 3.6 If the Complainant chooses to proceed with the complaint, they will be asked to provide full details in writing including: the name of the Mediator; the nature of the complaint; and any prior attempts to resolve the issue. Copies of any documents supporting the complaint should also be provided. 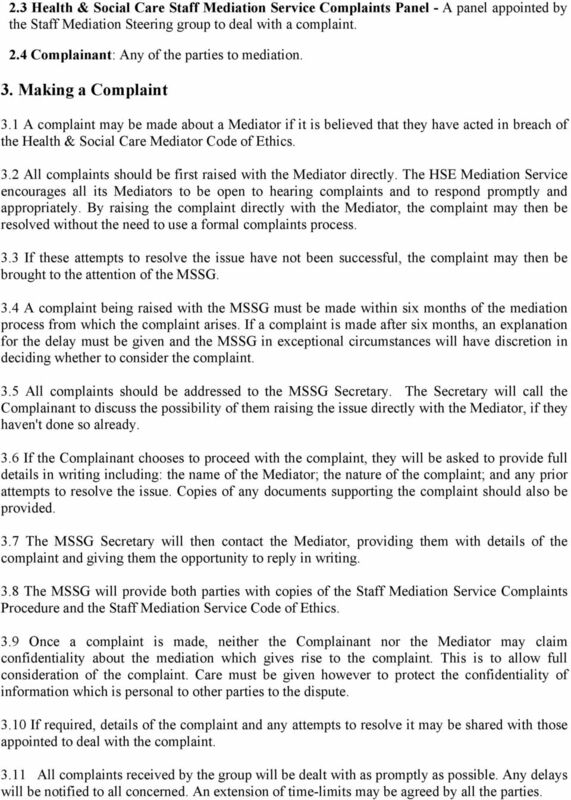 3.7 The MSSG Secretary will then contact the Mediator, providing them with details of the complaint and giving them the opportunity to reply in writing. 3.8 The MSSG will provide both parties with copies of the Staff Mediation Service Complaints Procedure and the Staff Mediation Service Code of Ethics. 3.9 Once a complaint is made, neither the Complainant nor the Mediator may claim confidentiality about the mediation which gives rise to the complaint. This is to allow full consideration of the complaint. Care must be given however to protect the confidentiality of information which is personal to other parties to the dispute If required, details of the complaint and any attempts to resolve it may be shared with those appointed to deal with the complaint All complaints received by the group will be dealt with as promptly as possible. Any delays will be notified to all concerned. An extension of time-limits may be agreed by all the parties. 19 3.12 If anyone involved in the complaints process believes there is a conflict of interest they should declare it and step down from the process where appropriate. 4. The Complaints Process 4.1 Once a Complainant has notified the MSSG that they wish to use the Complaints process, the MSSG Secretary notifies the Mediator and the Joint Chairs The Joint Chairs agree a Complaints Panel and check that there is no conflict of interest for any of the three members to hear the complaint. 4.3 The Chair of the Complaints Panel writes to the Complainant and the Mediator, providing copies of all the documents received so far and notifying them of the names of the Complaints Panel members. 4.4 If the Mediator has not already done so, the Chair will ask him /her to respond in writing to the complaint within 21 days. 4.5 The Chair will send a copy of the Mediator's reply to the Complainant who has 21 days to reply further if they choose. 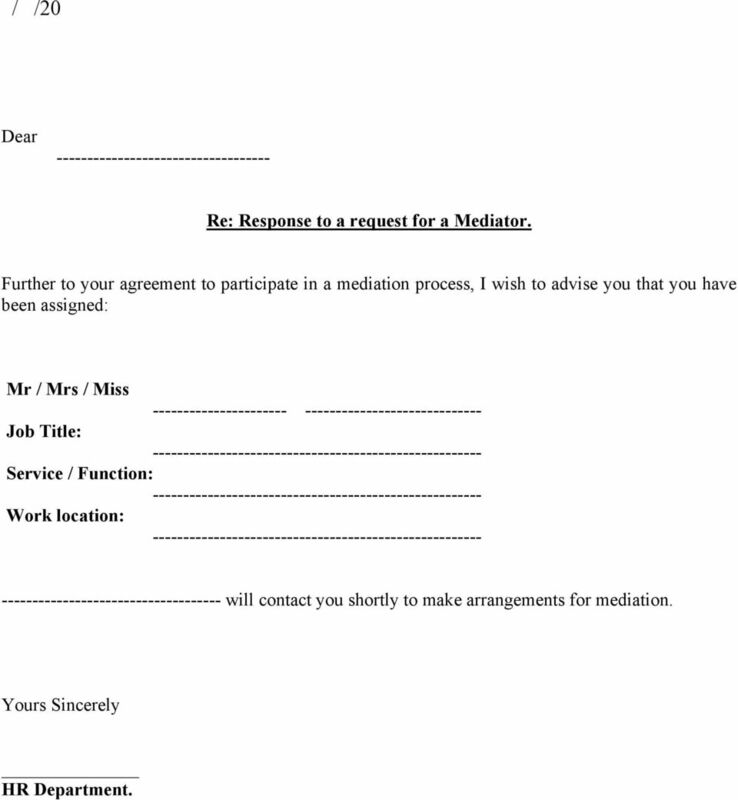 The Chair will send a copy of any reply to the Mediator. 4.6 The Complaints Panel will invite the parties to meet with them to consider the complaint. 4.7 The Complaints Panel may meet more than once and will make their decision within 14 days of their final meeting. The Chair will then write to the Complainant and the mediator with their findings. 5. 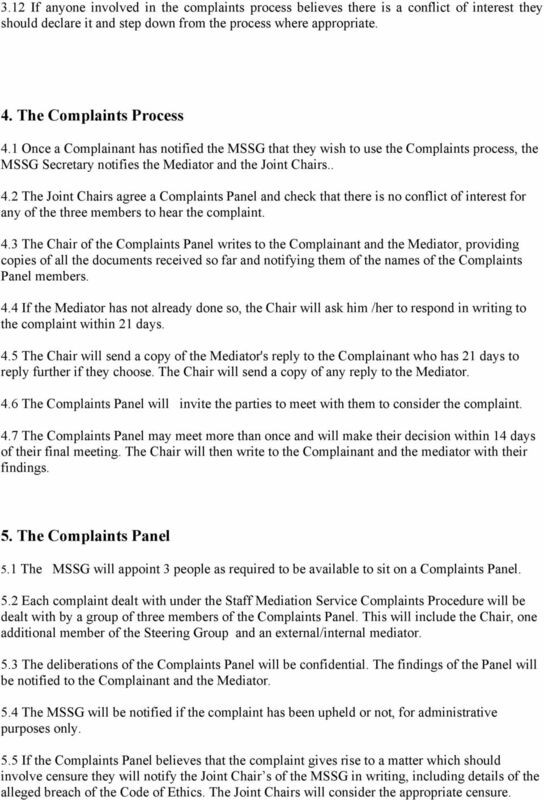 The Complaints Panel 5.1 The MSSG will appoint 3 people as required to be available to sit on a Complaints Panel. 5.2 Each complaint dealt with under the Staff Mediation Service Complaints Procedure will be dealt with by a group of three members of the Complaints Panel. This will include the Chair, one additional member of the Steering Group and an external/internal mediator. 5.3 The deliberations of the Complaints Panel will be confidential. The findings of the Panel will be notified to the Complainant and the Mediator. 5.4 The MSSG will be notified if the complaint has been upheld or not, for administrative purposes only. 5.5 If the Complaints Panel believes that the complaint gives rise to a matter which should involve censure they will notify the Joint Chair s of the MSSG in writing, including details of the alleged breach of the Code of Ethics. The Joint Chairs will consider the appropriate censure. UNIVERSITY OF SUSSEX. 1.3 This procedure and any revisions to it will be collectively agreed with the University's recognised trade unions. Complaint: means a written document which complies with Section 8.3 below, alleging that this policy has been violated. PART 1: Relations with Colleagues, Clients, Employers and Code of Ethics INTRODUCTION CODE OF ETHICS Membership of The Institution of Engineers of Ireland (Engineers Ireland) gives you rights and privileges. Resolving Workplace Concerns or Conflict Procedure. Code of Practice means the Family Mediation Council s code of practice for family mediation. What is the Objective of the Dispute Resolution Process (DPR)? Thank you for applying to join or renew membership with the UK Association of Letting Agents. UKALA: letting agents thrive UKALA Membership Team Skyline House-2nd Floor 200 Union Street, London SE1 0LX s Thank you for applying to join or renew membership with the UK Association of Letting Agents.